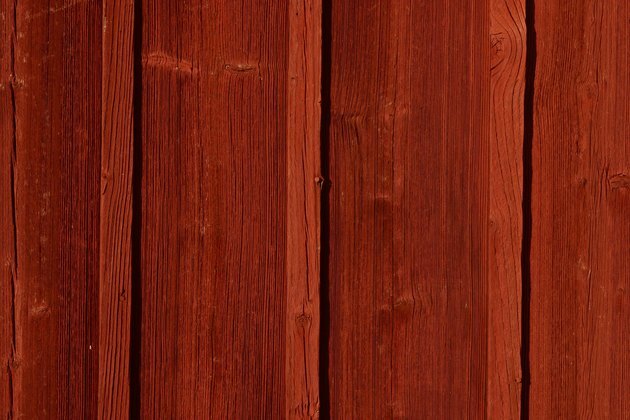 Cedar naturally resists moisture and insect damage, making it a top choice for outdoor fences, furniture and decking, but it also provides a rustic appeal when used as interior flooring. Unlike hardwood flooring with tongue-and-groove technology, planks made from cedar, a softwood species, have blunt ends and edges. Knots, especially large ones, have a way of working out of a plank, but when you install the boards with construction adhesive, you can minimize knot pop. Cedar is suitable for rustic-style flooring. Cedar planking requires a subfloor to serve as a base. Because of its relative softness, installing the planks over furring strips can lead to warping. Standard 3/4-inch tongue-and-groove plywood or oriented strand board (OSB) provides an adequate base on which to install cedar planking. Because you're going to use adhesive, don't install a felt or resin paper over the subfloor. Install cedar planks perpendicular to the direction of the floor joists. Locate the joists and snap a chalk line over each one as a visual guide. A layer of subfloor adhesive, spread with a notched trowel over the subflooring, helps in two ways. It secures the edges and ends of the planks to the subfloor, and it bonds the bottoms of wood knots to keep them from working out of the planks. Two fasteners, evenly spaced, should be inserted through the planks over every joist. Cedar splits easily, so pre-drilling the holes for the screws is essential. The best way to do this is to select a drill bit the same size as the screws you're using, and pre-drill the holes only through the cedar, but not into the subfloor or joist. When you insert the screw, the threads will catch and hold tightly when the screw reaches the subfloor, but it won't cause the cedar to split. If you want a sleek look, you can attach the flooring with finish screws or nails, inserting them into the pre-drilled holes. If you want to stay with the rustic look, however, use decking screws to install the planks, and countersink the heads about 1/8 inch below the surface of the cedar. After you sand and seal the flooring, fill the holes with a shade of wood putty that is darker than the wood. Then you can finish sand and apply a topcoat finish to the boards. This technique gives the floor an attractive Old World look.